Shelley's Transformation was first published in The Keepsake in 1831. "Before you too much condemn me, permit me to say that no one better knows than I the value of his own body; no one, probably, except myself, ever having had it stolen from him." Why should it not be thus? Why tell a tale of impious tempting of Providence, and soul-subduing humiliation? Why? answer me, ye who are wise in the secrets of human nature! I only know that so it is; and in spite of strong resolve,—of a pride that too much masters me—of shame, and even of fear, so to render myself odious to my species,—I must speak. Genoa! my birthplace—proud city! looking upon the blue Mediterranean—dost thou remember me in my boyhood, when thy cliffs and promontories, thy bright sky and gay vineyards, were my world? Happy time! when to the young heart the narrow-bounded universe, which leaves, by its very limitation, free scope to the imagination, enchains our physical energies, and, sole period in our lives, innocence and enjoyment are united. Yet, who can look back to childhood, and not remember its sorrows and its harrowing fears? I was born with the most imperious, haughty, tameless spirit. I quailed before my father only; and he, generous and noble, but capricious and tyrannical, at once fostered and checked the wild impetuosity of my character, making obedience necessary, but inspiring no respect for the motives which guided his commands. To be a man, free, independent; or, in better words, insolent and domineering, was the hope and prayer of my rebel heart. My father had one friend, a wealthy Genoese noble, who in a political tumult was suddenly sentenced to banishment, and his property confiscated. The Marchese Torella went into exile alone. Like my father, he was a widower: he had one child, the almost infant Juliet, who was left under my father’s guardianship. I should certainly have been unkind to the lovely girl, but that I was forced by my position to become her protector. A variety of childish incidents all tended to one point,—to make Juliet see in me a rock of defence; I in her, one who must perish through the soft sensibility of her nature too rudely visited, but for my guardian care. We grew up together. The opening rose in May was not more sweet than this dear girl. An irradiation of beauty was spread over her face. Her form, her step, her voice—my heart weeps even now, to think of all of relying, gentle, loving, and pure, that she enshrined. When I was eleven and Juliet eight years of age, a cousin of mine, much older than either—he seemed to us a man—took great notice of my playmate; he called her his bride, and asked her to marry him. She refused, and he insisted, drawing her unwillingly towards him. With the countenance and emotions of a maniac I threw myself on him—I strove to draw his sword—I clung to his neck with the ferocious resolve to strangle him: he was obliged to call for assistance to disengage himself from me. On that night I led Juliet to the chapel of our house: I made her touch the sacred relics—I harrowed her child’s heart, and profaned her child’s lips with an oath, that she would be mine, and mine only. Well, those days passed away. Torella returned in a few years, and became wealthier and more prosperous than ever. When I was seventeen, my father died; he had been magnificent to prodigality; Torella rejoiced that my minority would afford an opportunity for repairing my fortunes. Juliet and I had been affianced beside my father’s deathbed—Torella was to be a second parent to me. I desired to see the world, and I was indulged. I went to Florence, to Rome, to Naples; thence I passed to Toulon, and at length reached what had long been the bourne of my wishes, Paris. There was wild work in Paris then. The poor king, Charles the Sixth, now sane, now mad, now a monarch, now an abject slave, was the very mockery of humanity. The queen, the dauphin, the Duke of Burgundy, alternately friends and foes,—now meeting in prodigal feasts, now shedding blood in rivalry,—were blind to the miserable state of their country, and the dangers that impended over it, and gave themselves wholly up to dissolute enjoyment or savage strife. My character still followed me. I was arrogant and self-willed; I loved display, and above all, I threw off all control. My young friends were eager to foster passions which furnished them with pleasures. I was deemed handsome—I was master of every knightly accomplishment. I was disconnected with any political party. I grew a favourite with all: my presumption and arrogance was pardoned in one so young: I became a spoiled child. Who could control me? not the letters and advice of Torella—only strong necessity visiting me in the abhorred shape of an empty purse. But there were means to refill this void. Acre after acre, estate after estate, I sold. My dress, my jewels, my horses and their caparisons, were almost unrivalled in gorgeous Paris, while the lands of my inheritance passed into possession of others. The Duke of Orleans was waylaid and murdered by the Duke of Burgundy. Fear and terror possessed all Paris. The dauphin and the queen shut themselves up; every pleasure was suspended. I grew weary of this state of things, and my heart yearned for my boyhood’s haunts. I was nearly a beggar, yet still I would go there, claim my bride, and rebuild my fortunes. A few happy ventures as a merchant would make me rich again. Nevertheless, I would not return in humble guise. My last act was to dispose of my remaining estate near Albaro for half its worth, for ready money. Then I despatched all kinds of artificers, arras, furniture of regal splendour, to fit up the last relic of my inheritance, my palace in Genoa. I lingered a little longer yet, ashamed at the part of the prodigal returned, which I feared I should play. I sent my horses. One matchless Spanish jennet I despatched to my promised bride: its caparisons flamed with jewels and cloth of gold. In every part I caused to be entwined the initials of Juliet and her Guido. My present found favour in hers and in her father’s eyes. Still to return a proclaimed spendthrift, the mark of impertinent wonder, perhaps of scorn, and to encounter singly the reproaches or taunts of my fellow-citizens, was no alluring prospect. As a shield between me and censure, I invited some few of the most reckless of my comrades to accompany me: thus I went armed against the world, hiding a rankling feeling, half fear and half penitence, by bravado. I arrived in Genoa. I trod the pavement of my ancestral palace. My proud step was no interpreter of my heart, for I deeply felt that, though surrounded by every luxury, I was a beggar. The first step I took in claiming Juliet must widely declare me such. I read contempt or pity in the looks of all. I fancied that rich and poor, young and old, all regarded me with derision. Torella came not near me. No wonder that my second father should expect a son’s deference from me in waiting first on him. But, galled and stung by a sense of my follies and demerit, I strove to throw the blame on others. We kept nightly orgies in Palazzo Carega. To sleepless, riotous nights followed listless, supine mornings. At the Ave Maria we showed our dainty persons in the streets, scoffing at the sober citizens, casting insolent glances on the shrinking women. Juliet was not among them—no, no; if she had been there, shame would have driven me away, if love had not brought me to her feet. I grew tired of this. Suddenly I paid the Marchese a visit. He was at his villa, one among the many which deck the suburb of San Pietro d’Arena. It was the month of May, the blossoms of the fruit-trees were fading among thick, green foliage; the vines were shooting forth; the ground strewed with the fallen olive blooms; the firefly was in the myrtle hedge; heaven and earth wore a mantle of surpassing beauty. Torella welcomed me kindly, though seriously; and even his shade of displeasure soon wore away. Some resemblance to my father—some look and tone of youthful ingenuousness, softened the good old man’s heart. He sent for his daughter—he presented me to her as her betrothed. The chamber became hallowed by a holy light as she entered. Hers was that cherub look, those large, soft eyes, full dimpled cheeks, and mouth of infantine sweetness, that expresses the rare union of happiness and love. Admiration first possessed me; she is mine! was the second proud emotion, and my lips curled with haughty triumph. I had not been the enfant gâté of the beauties of France not to have learnt the art of pleasing the soft heart of woman. If towards men I was overbearing, the deference I paid to them was the more in contrast. I commenced my courtship by the display of a thousand gallantries to Juliet, who, vowed to me from infancy, had never admitted the devotion of others; and who, though accustomed to expressions of admiration, was uninitiated in the language of lovers. For a few days all went well. Torella never alluded to my extravagance; he treated me as a favourite son. But the time came, as we discussed the preliminaries to my union with his daughter, when this fair face of things should be overcast. A contract had been drawn up in my father’s lifetime. I had rendered this, in fact, void by having squandered the whole of the wealth which was to have been shared by Juliet and myself. Torella, in consequence, chose to consider this bond as cancelled, and proposed another, in which, though the wealth he bestowed was immeasurably increased, there were so many restrictions as to the mode of spending it, that I, who saw independence only in free career being given to my own imperious will, taunted him as taking advantage of my situation, and refused utterly to subscribe to his conditions. The old man mildly strove to recall me to reason. Roused pride became the tyrant of my thought: I listened with indignation—I repelled him with disdain. Fiend I must have been with such sophistry to endeavour to poison that sanctuary of holy thought and tender love. Juliet shrank from me affrighted. Her father was the best and kindest of men, and she strove to show me how, in obeying him, every good would follow. He would receive my tardy submission with warm affection, and generous pardon would follow my repentance;—profitless words for a young and gentle daughter to use to a man accustomed to make his will law, and to feel in his own heart a despot so terrible and stern that he could yield obedience to nought save his own imperious desires! My resentment grew with resistance; my wild companions were ready to add fuel to the flame. We laid a plan to carry off Juliet. At first it appeared to be crowned with success. Midway, on our return, we were overtaken by the agonized father and his attendants. A conflict ensued. Before the city guard came to decide the victory in favour of our antagonists, two of Torella’s servitors were dangerously wounded. This portion of my history weighs most heavily with me. Changed man as I am, I abhor myself in the recollection. May none who hear this tale ever have felt as I. A horse driven to fury by a rider armed with barbed spurs was not more a slave than I to the violent tyranny of my temper. A fiend possessed my soul, irritating it to madness. I felt the voice of conscience within me; but if I yielded to it for a brief interval, it was only to be a moment after torn, as by a whirlwind, away—borne along on the stream of desperate rage—the plaything of the storms engendered by pride. I was imprisoned, and, at the instance of Torella, set free. Again I returned to carry off both him and his child to France, which hapless country, then preyed on by freebooters and gangs of lawless soldiery, offered a grateful refuge to a criminal like me. Our plots were discovered. I was sentenced to banishment; and, as my debts were already enormous, my remaining property was put in the hands of commissioners for their payment. Torella again offered his mediation, requiring only my promise not to renew my abortive attempts on himself and his daughter. I spurned his offers, and fancied that I triumphed when I was thrust out from Genoa, a solitary and penniless exile. My companions were gone: they had been dismissed the city some weeks before, and were already in France. I was alone—friendless, with neither sword at my side, nor ducat in my purse. I wandered along the sea-shore, a whirlwind of passion possessing and tearing my soul. It was as if a live coal had been set burning in my breast. At first I meditated on what I should do. I would join a band of freebooters. Revenge!—the word seemed balm to me; I hugged it, caressed it, till, like a serpent, it stung me. Then again I would abjure and despise Genoa, that little corner of the world. I would return to Paris, where so many of my friends swarmed; where my services would be eagerly accepted; where I would carve out fortune with my sword, and make my paltry birthplace and the false Torella rue the day when they drove me, a new Coriolanus, from her walls. I would return to Paris—thus on foot—a beggar—and present myself in my poverty to those I had formerly entertained sumptuously? There was gall in the mere thought of it. The reality of things began to dawn upon my mind, bringing despair in its train. For several months I had been a prisoner: the evils of my dungeon had whipped my soul to madness, but they had subdued my corporeal frame. I was weak and wan. Torella had used a thousand artifices to administer to my comfort; I had detected and scorned them all, and I reaped the harvest of my obduracy. What was to be done? Should I crouch before my foe, and sue for forgiveness?—Die rather ten thousand deaths!—Never should they obtain that victory! Hate—I swore eternal hate! Hate from whom?—to whom?—From a wandering outcast—to a mighty noble! I and my feelings were nothing to them: already had they forgotten one so unworthy. And Juliet!—her angel face and sylph-like form gleamed among the clouds of my despair with vain beauty; for I had lost her—the glory and flower of the world! Another will call her his!—that smile of paradise will bless another! Even now my heart fails within me when I recur to this rout of grim-visaged ideas. Now subdued almost to tears, now raving in my agony, still I wandered along the rocky shore, which grew at each step wilder and more desolate. Hanging rocks and hoar precipices overlooked the tideless ocean; black caverns yawned; and for ever, among the seaworn recesses, murmured and dashed the unfruitful waters. Now my way was almost barred by an abrupt promontory, now rendered nearly impracticable by fragments fallen from the cliff. Evening was at hand, when, seaward, arose, as if on the waving of a wizard’s wand, a murky web of clouds, blotting the late azure sky, and darkening and disturbing the till now placid deep. The clouds had strange, fantastic shapes, and they changed and mingled and seemed to be driven about by a mighty spell. The waves raised their white crests; the thunder first muttered, then roared from across the waste of waters, which took a deep purple dye, flecked with foam. The spot where I stood looked, on one side, to the widespread ocean; on the other, it was barred by a rugged promontory. Round this cape suddenly came, driven by the wind, a vessel. In vain the mariners tried to force a path for her to the open sea—the gale drove her on the rocks. It will perish!—all on board will perish! Would I were among them! And to my young heart the idea of death came for the first time blended with that of joy. It was an awful sight to behold that vessel struggling with her fate. Hardly could I discern the sailors, but I heard them. It was soon all over! A rock, just covered by the tossing waves, and so unperceived, lay in wait for its prey. A crash of thunder broke over my head at the moment that, with a frightful shock, the vessel dashed upon her unseen enemy. In a brief space of time she went to pieces. There I stood in safety; and there were my fellow-creatures battling, how hopelessly, with annihilation. Methought I saw them struggling—too truly did I hear their shrieks, conquering the barking surges in their shrill agony. The dark breakers threw hither and thither the fragments of the wreck: soon it disappeared. I had been fascinated to gaze till the end: at last I sank on my knees—I covered my face with my hands. I again looked up; something was floating on the billows towards the shore. It neared and neared. Was that a human form? It grew more and more distinct; and at last a mighty wave, lifting the whole freight, lodged it upon a rock. A human being bestriding a sea-chest!—a human being! Yet was it one? 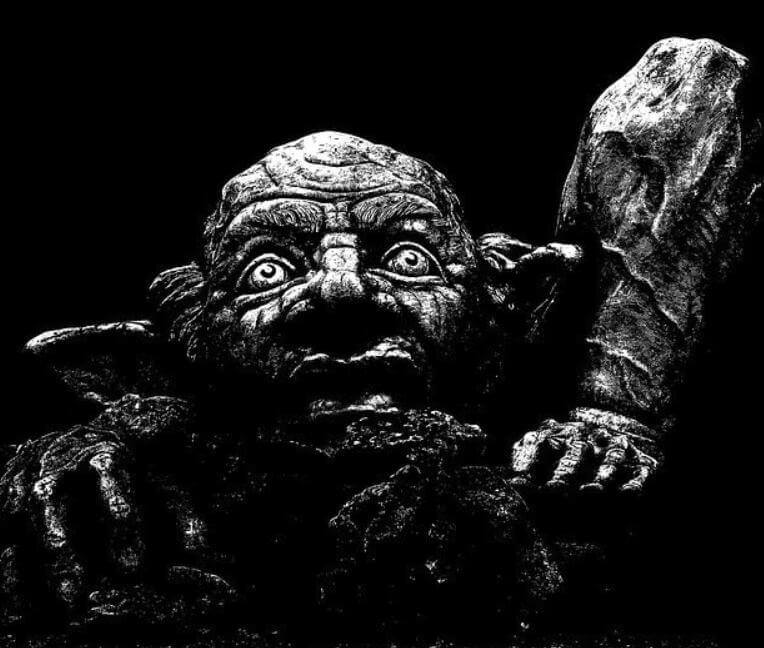 Surely never such had existed before—a misshapen dwarf, with squinting eyes, distorted features, and body deformed, till it became a horror to behold. My blood, lately warming towards a fellow-being so snatched from a watery tomb, froze in my heart. The dwarf got off his chest; he tossed his straight, struggling hair from his odious visage. As he spoke, he stretched out his two long, lank arms, that looked like spider’s claws, and seemed to embrace with them the expanse before him. Was it a miracle? The clouds became broken and fled; the azure sky first peeped out, and then was spread a calm field of blue above us; the stormy gale was exchanged to the softly breathing west; the sea grew calm; the waves dwindled to riplets. It was tempting Providence to interchange talk with this magician. But Power, in all its shapes, is respected by man. Awe, curiosity, a clinging fascination, drew me towards him. The voice of the wretch was screeching and horrid, and his contortions as he spoke were frightful to behold. Yet he did gain a kind of influence over me, which I could not master, and I told him my tale. When it was ended, he laughed long and loud: the rocks echoed back the sound: hell seemed yelling around me. As he spoke, a thousand fanged thoughts stung me to the heart. “What would you that I should do?” I cried. The dwarf had been seated on his chest as he listened to my story. Now he got off; he touched a spring; it flew open! What a mine of wealth—of blazing jewels, beaming gold, and pale silver—was displayed therein. A mad desire to possess this treasure was born within me. I shivered. Would this all-powerful monster murder me? I had no dagger. I forgot to pray—but I grew pale. We are told that it is dangerous to hold unlawful talk; and well do I prove the same. Tamely written down, it may seem incredible that I should lend any ear to this proposition; but, in spite of his unnatural ugliness, there was something fascinating in a being whose voice could govern earth, air, and sea. I felt a keen desire to comply; for with that chest I could command the worlds. My only hesitation resulted from a fear that he would not be true to his bargain. Then, I thought, I shall soon die here on these lonely sands, and the limbs he covets will be mine no more:—it is worth the chance. And, besides, I knew that, by all the rules of art-magic, there were formula and oaths which none of its practisers dared break. I hesitated to reply; and he went on, now displaying his wealth, now speaking of the petty price he demanded, till it seemed madness to refuse. Thus is it;—place our bark in the current of the stream, and down, over fall and cataract it is hurried; give up our conduct to the wild torrent of passion, and we are away, we know not whither. He swore many an oath, and I adjured him by many a sacred name; till I saw this wonder of power, this ruler of the elements, shiver like an autumn leaf before my words; and as if the spirit spake unwillingly and perforce within him, at last, he, with broken voice, revealed the spell whereby he might be obliged, did he wish to play me false, to render up the unlawful spoil. Our warm life-blood must mingle to make and to mar the charm. Enough of this unholy theme. I was persuaded—the thing was done. The morrow dawned upon me as I lay upon the shingles, and I knew not my own shadow as it fell from me. I felt myself changed to a shape of horror, and cursed my easy faith and blind credulity. The chest was there—there the gold and precious stones for which I had sold the frame of flesh which nature had given me. The sight a little stilled my emotions: three days would soon be gone. They did pass. The dwarf had supplied me with a plenteous store of food. At first I could hardly walk, so strange and out of joint were all my limbs; and my voice—it was that of the fiend. But I kept silent, and turned my face to the sun, that I might not see my shadow, and counted the hours, and ruminated on my future conduct. To bring Torella to my feet—to possess my Juliet in spite of him—all this my wealth could easily achieve. During dark night I slept, and dreamt of the accomplishment of my desires. Two suns had set—the third dawned. I was agitated, fearful. Oh expectation, what a frightful thing art thou, when kindled more by fear than hope! How dost thou twist thyself round the heart, torturing its pulsations! How dost thou dart unknown pangs all through our feeble mechanism, now seeming to shiver us like broken glass, to nothingness—now giving us a fresh strength, which can do nothing, and so torments us by a sensation, such as the strong man must feel who cannot break his fetters, though they bend in his grasp. Slowly paced the bright, bright orb up the eastern sky; long it lingered in the zenith, and still more slowly wandered down the west: it touched the horizon’s verge—it was lost! Its glories were on the summits of the cliff—they grew dun and grey. The evening star shone bright. He will soon be here. He came not!—By the living heavens, he came not!—and night dragged out its weary length, and, in its decaying age, “day began to grizzle its dark hair;” and the sun rose again on the most miserable wretch that ever upbraided its light. Three days thus I passed. The jewels and the gold—oh, how I abhorred them! Well, well—I will not blacken these pages with demoniac ravings. All too terrible were the thoughts, the raging tumult of ideas that filled my soul. At the end of that time I slept; I had not before since the third sunset; and I dreamt that I was at Juliet’s feet, and she smiled, and then she shrieked—for she saw my transformation—and again she smiled, for still her beautiful lover knelt before her. But it was not I—it was he, the fiend, arrayed in my limbs, speaking with my voice, winning her with my looks of love. I strove to warn her, but my tongue refused its office; I strove to tear him from her, but I was rooted to the ground—I awoke with the agony. There were the solitary hoar precipices—there the plashing sea, the quiet strand, and the blue sky over all. What did it mean? was my dream but a mirror of the truth? was he wooing and winning my betrothed? I would on the instant back to Genoa—but I was banished. I laughed—the dwarf’s yell burst from my lips—I banished! Oh no! they had not exiled the foul limbs I wore; I might with these enter, without fear of incurring the threatened penalty of death, my own, my native city. I began to walk towards Genoa. I was somewhat accustomed to my distorted limbs; none were ever so ill-adapted for a straightforward movement; it was with infinite difficulty that I proceeded. Then, too, I desired to avoid all the hamlets strewed here and there on the sea-beach, for I was unwilling to make a display of my hideousness. I was not quite sure that, if seen, the mere boys would not stone me to death as I passed, for a monster; some ungentle salutations I did receive from the few peasants or fishermen I chanced to meet. But it was dark night before I approached Genoa. The weather was so balmy and sweet that it struck me that the Marchese and his daughter would very probably have quitted the city for their country retreat. It was from Villa Torella that I had attempted to carry off Juliet; I had spent many an hour reconnoitring the spot, and knew each inch of ground in its vicinity. It was beautifully situated, embosomed in trees, on the margin of a stream. As I drew near, it became evident that my conjecture was right; nay, moreover, that the hours were being then devoted to feasting and merriment. For the house was lighted up; strains of soft and gay music were wafted towards me by the breeze. My heart sank within me. Such was the generous kindness of Torella’s heart that I felt sure that he would not have indulged in public manifestations of rejoicing just after my unfortunate banishment, but for a cause I dared not dwell upon. The country people were all alive and flocking about; it became necessary that I should conceal myself; and yet I longed to address some one, or to hear others discourse, or in any way to gain intelligence of what was really going on. At length, entering the walks that were in immediate vicinity to the mansion, I found one dark enough to veil my excessive frightfulness; and yet others as well as I were loitering in its shade. I soon gathered all I wanted to know—all that first made my very heart die with horror, and then boil with indignation. To-morrow Juliet was to be given to the penitent, reformed, beloved Guido—to-morrow my bride was to pledge her vows to a fiend from hell! And I did this!—my accursed pride—my demoniac violence and wicked self-idolatry had caused this act. For if I had acted as the wretch who had stolen my form had acted—if, with a mien at once yielding and dignified, I had presented myself to Torella, saying, I have done wrong, forgive me; I am unworthy of your angel-child, but permit me to claim her hereafter, when my altered conduct shall manifest that I abjure my vices, and endeavour to become in some sort worthy of her. I go to serve against the infidels; and when my zeal for religion and my true penitence for the past shall appear to you to cancel my crimes, permit me again to call myself your son. Thus had he spoken; and the penitent was welcomed even as the prodigal son of Scripture: the fatted calf was killed for him; and he, still pursuing the same path, displayed such open-hearted regret for his follies, so humble a concession of all his rights, and so ardent a resolve to reacquire them by a life of contrition and virtue, that he quickly conquered the kind old man; and full pardon, and the gift of his lovely child, followed in swift succession. Oh, had an angel from Paradise whispered to me to act thus! But now, what would be the innocent Juliet’s fate? Would God permit the foul union—or, some prodigy destroying it, link the dishonoured name of Carega with the worst of crimes? To-morrow at dawn they were to be married: there was but one way to prevent this—to meet mine enemy, and to enforce the ratification of our agreement. I felt that this could only be done by a mortal struggle. I had no sword—if indeed my distorted arms could wield a soldier’s weapon—but I had a dagger, and in that lay my hope. There was no time for pondering or balancing nicely the question: I might die in the attempt; but besides the burning jealousy and despair of my own heart, honour, mere humanity, demanded that I should fall rather than not destroy the machinations of the fiend. The guests departed—the lights began to disappear; it was evident that the inhabitants of the villa were seeking repose. I hid myself among the trees—the garden grew desert—the gates were closed—I wandered round and came under a window—ah! well did I know the same!—a soft twilight glimmered in the room—the curtains were half withdrawn. It was the temple of innocence and beauty. Its magnificence was tempered, as it were, by the slight disarrangements occasioned by its being dwelt in, and all the objects scattered around displayed the taste of her who hallowed it by her presence. I saw her enter with a quick light step—I saw her approach the window—she drew back the curtain yet further, and looked out into the night. Its breezy freshness played among her ringlets, and wafted them from the transparent marble of her brow. She clasped her hands, she raised her eyes to heaven. I heard her voice. Guido! she softly murmured—mine own Guido! and then, as if overcome by the fulness of her own heart, she sank on her knees;—her upraised eyes—her graceful attitude—the beaming thankfulness that lighted up her face—oh, these are tame words! Heart of mine, thou imagest ever, though thou canst not portray, the celestial beauty of that child of light and love. I heard a step—a quick firm step along the shady avenue. Soon I saw a cavalier, richly dressed, young and, methought, graceful to look on, advance. I hid myself yet closer. The youth approached; he paused beneath the window. She arose, and again looking out she saw him, and said—I cannot, no, at this distant time I cannot record her terms of soft silver tenderness; to me they were spoken, but they were replied to by him. The descending dagger was arrested at the word, and he, feeling my hold relax, extricated himself and drew his sword, while the uproar in the house, and flying of torches from one room to the other, showed that soon we should be separated. In the midst of my frenzy there was much calculation:—fall I might, and so that he did not survive, I cared not for the death-blow I might deal against myself. While still, therefore, he thought I paused, and while I saw the villanous resolve to take advantage of my hesitation, in the sudden thrust he made at me, I threw myself on his sword, and at the same moment plunged my dagger, with a true, desperate aim, in his side. We fell together, rolling over each other, and the tide of blood that flowed from the gaping wound of each mingled on the grass. More I know not—I fainted. Again I return to life: weak almost to death, I found myself stretched upon a bed—Juliet was kneeling beside it. Strange! my first broken request was for a mirror. I was so wan and ghastly, that my poor girl hesitated, as she told me afterwards; but, by the mass! I thought myself a right proper youth when I saw the dear reflection of my own well-known features. I confess it is a weakness, but I avow it, I do entertain a considerable affection for the countenance and limbs I behold, whenever I look at a glass; and have more mirrors in my house, and consult them oftener, than any beauty in Genoa. Before you too much condemn me, permit me to say that no one better knows than I the value of his own body; no one, probably, except myself, ever having had it stolen from him. Incoherently I at first talked of the dwarf and his crimes, and reproached Juliet for her too easy admission of his love. She thought me raving, as well she might; and yet it was some time before I could prevail on myself to admit that the Guido whose penitence had won her back for me was myself; and while I cursed bitterly the monstrous dwarf, and blest the well-directed blow that had deprived him of life, I suddenly checked myself when I heard her say, Amen! knowing that him whom she reviled was my very self. A little reflection taught me silence—a little practice enabled me to speak of that frightful night without any very excessive blunder. The wound I had given myself was no mockery of one—it was long before I recovered—and as the benevolent and generous Torella sat beside me, talking such wisdom as might win friends to repentance, and mine own dear Juliet hovered near me, administering to my wants, and cheering me by her smiles, the work of my bodily cure and mental reform went on together. I have never, indeed, wholly recovered my strength—my cheek is paler since—my person a little bent. Juliet sometimes ventures to allude bitterly to the malice that caused this change, but I kiss her on the moment, and tell her all is for the best. I am a fonder and more faithful husband, and true is this—but for that wound, never had I called her mine. I did not revisit the sea-shore, nor seek for the fiend’s treasure; yet, while I ponder on the past, I often think, and my confessor was not backward in favouring the idea, that it might be a good rather than an evil spirit, sent by my guardian angel, to show me the folly and misery of pride. So well at least did I learn this lesson, roughly taught as I was, that I am known now by all my friends and fellow-citizens by the name of Guido il Cortese. You may also enjoy Shelley's The Invisible Girl and our Gothic, Ghost, Horror & Weird Library. Add Transformation to your own personal library.